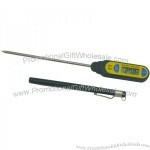 Cooking thermometer with meat probe that folds in for safe storage. 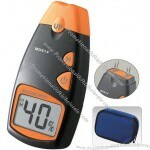 Displays temperature in Fahrenheit and Celsius and comes with a cooking temperature guide on the back of the thermometer. Button cell battery included. Power On: Water sensor, not switch. 433.92mhz transmitter frequency with a range of up to 60m/200ft. 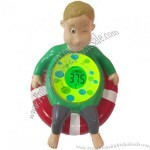 Includes 12/24hr format, indoor/outdoor thermometer display in C/F which is lit up on an LCD screen. 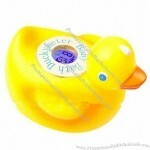 Includes four AAA batteries for the sensor and base. Upgrade to Duracell batteries for $2 per item (please specify at time of order). Temperature ranges between -20C (-4F) and 60C (140F). Protective Cap, replacement probes and carrying case included. Digital LCD display with luminescence back-light. Aesthertics protection cap for safe carrying and operating. Harden and golss treatment on display-window for abrasion-proof and long-term clean. 5.5% to 99.9% moisture range,with DC 0 to 1V Output. Stores up to 99 readings ,Max./Min. Average values recalled. Auto.temperature compensation and internal calibration. Ergonomics design, easy operating, comfortable and durable. Usable and changeable of extension probe. 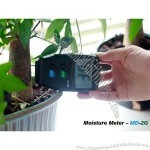 This Digital Moisture Meter is great for any hobby, professional woodworker or craftsman. It is small and lightweight, so you can use it at home or take it with you to check the quality of the wood you buy. This is also a great tool for detecting damp, rotting wood or wet walls when you inspect your home. Measure the temperature and humidity with this digital thermometer and hygrometer. 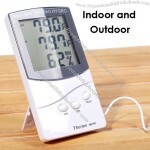 It comes with an easy-to-read LCD screen, it is suitable for both indoor and outdoor: home, office, school, terrariums or aquarium with a measurement range from -10°C to 50°C, featuring switchable display from °C to F.
There's nothing more important than your health, so make sure that you and your loved ones are healthy with the Forehead Thermometer from PromotionalGiftWholesale.Com. 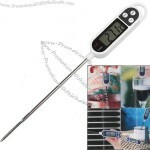 This thermometer is an easy and more sanitary alternative to the standard under-the-tongue thermometer. 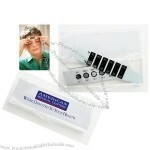 Forehead Thermometers are an inexpensive and effective way to market your brand or business. Case has an imprint area of 3 1/4" x 1"
Whether your customers live in the Arctic Circle, along the equator or anywhere else, knowing what the temperature outside is shares equal importance. Nobody wants to walk outside thinking it's sixty degrees and instead find out it's 90 degrees. 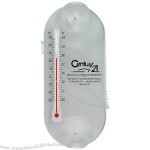 Keep all your customers informed by giving out a Large Acrylic Oval Temperature Gauge from PromotionalGiftWholesale.Com! Everyone has that one friend or family member that asks, "Is it cold out?" before leaving the house. 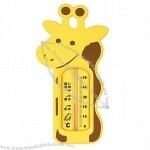 Now your customers can tell them exactly what temperature it is with these Tempatures Keytags you handed out from PromotionalGiftWholesale.Com. Each custom keytag has a mini thermometer attached to it to give the best reading possible on the temperature. There won't be any guessing now about whether it's too cold to wear shorts with these promotional keytags in their possession! Hand them out at trade shows or conventions to attract customers to your booth, no one else will think to hand these out! If your last marketing campaign left you stranded, cold, and alone, then don't repeat your same mistakes this time around. 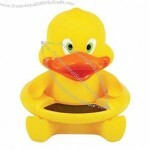 Give customers a promotional product they'll want to keep around for years and years! 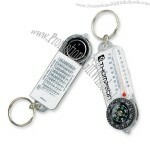 PromotionalGiftWholesale.Com' Thermometer Compass Key Tag will lead customers back to you time after time. 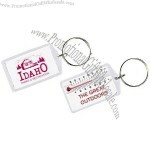 These custom key tags are a red hot value that will keep your popularity going in the right direction. It's a favorite promotional key ring among your outdoorsy customers who love going for hikes, mountain biking, camping, anything and everything outside. Open the battery compartment on the back to load battery or take off the battery insulation tap (if battery pre-load). Press "ON/OFF'' first time, LCD will start to work (show the temperature). Pres "ON/OFF" again to stop LCD working. Press "C/F" button to convert Celsius or Fahrenheit. Remove the protective sheath from stem. Insert stem into the area of object need be measured (At leas 1/2 length of stem must be inserted). 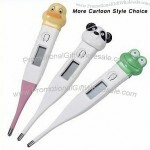 Custom-made Thermometer From China Factory, Low price Thermometer, Top Quality, True wholesale source for original!